Don’t Discourage. 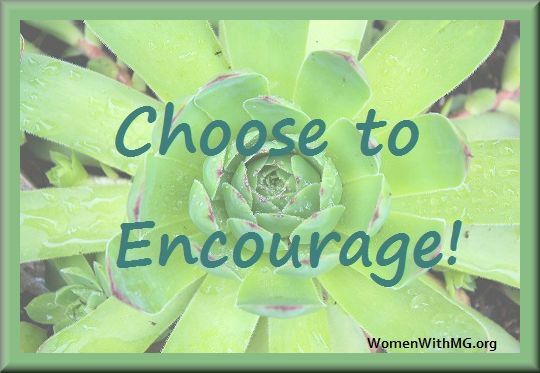 Choose to Encourage! One of the most frustrating things about having a chronic illness is that anytime you push yourself to do something that you aren’t really able to do, there is always some smart alec who says, “Oh she must not really be sick.” or “Clearly she’s not got the problems her doctors say that she does.” etc etc. As if it never enters their minds what you might be sacrificing, to push yourself to do whatever it is, or the very high price you pay afterwards for having done it. They don’t realize that perhaps you spent the day before in bed, so that you could possibly be able to push yourself harder the following day. Or how long you might be stuck in bed or in pain or struggling to breathe, because of what they saw you do “just fine” prior to that. 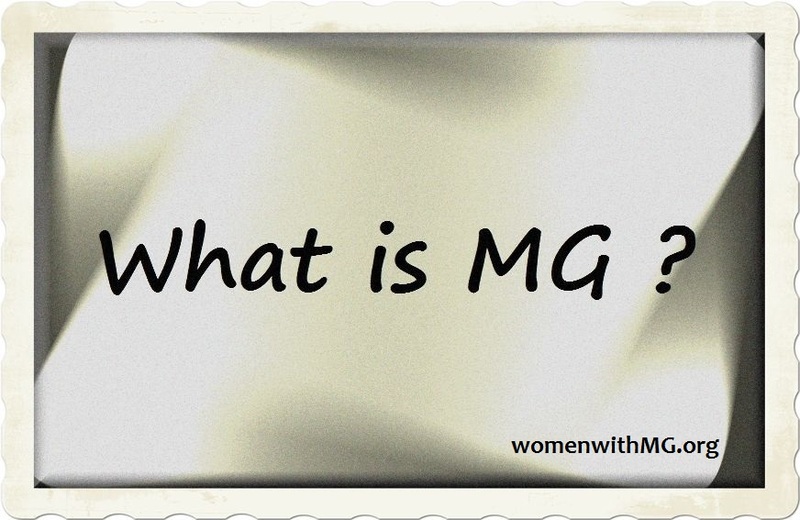 The symptoms of many diseases fluctuate, but fluctuations are a hallmark of MG. Doubting someone’s disability or MG diagnosis because of a fluctuation in symptoms, is doubting them for one of the defining factors of this disease. I know MG patients who at times turn down opportunities to do things, because of the harsh judgement they know they will receive if they take advantage of that rare moment of more muscle strength. Most of us plow right ahead and do what we can, but even that has a toll that goes beyond the physical. The criticism, the rude comments: they hurt. The stress from the actions of others, physically harms us and worsens our disease – because that is what stress does to MG. The impact of stress on Myasthenia Gravis is a well-documented fact. Each day is a different day. I want to live to my fullest potential every single day of my life. And I am stubborn enough to do that, regardless of what others say. But it would be nice to only be encouraged when I have a good day, or a brief bit of time where I have more muscle strength, rather than attacked for it. PLEASE approach these matters with common sense. Realize that people fighting illness want and deserve to have lives too. And just because they push themselves to do more than they are able (or doctor-recommended) in some moments, does not mean that they are able to do those things every day. What it does mean is that they are human and they want to live the biggest life that they can. Maybe they can’t do the things that you can do, but they want to do whatever they can and they shouldn’t be insulted, talked about, criticized, or doubted for simply trying to live a little. They should be applauded for getting up every day and doing the best that they can, in the confines of whatever their limitations are for that day. Never criticize someone for doing what they can. Because if you do that, what you are actually saying is that because someone has an illness, you expect them to sit and do nothing all day, no matter how they feel. To give up. Which only leads to someone getting sicker. Is that really what you want? Is that the message that you wish to send? Or do you want disabled people to reach for their personal best every day – no matter what that is? If the answer is no, then correct it. You are in control of your behavior. You can stop saying things that hurt and start saying things that encourage. Complement their achievements – no matter how small. Replace that language with things like, “I am so happy you were able to do that!” or “I am so grateful that you had a better day today.” or whatever version of that you are comfortable putting into your own words. The point is, those phrases lift people up. They don’t put people down. We all know people with a disabilities. Will you make a decision today to try to be a source of encouragement to those with disabilities in your life? Thank you so much for sharing this. Just reading it encouraged me. It is very difficult having MG and working around those that are not supportive. Everyday it is a battle, and my strength comes from within me. I will share this with family and friends. Thanks so much.